I couldn’t believe my eyes! I was at a flea market earlier this week and I saw it! It was on a table as clear as life. I have looked on ebay so many times for this game that I enjoyed in my childhood. I’ve found it but couldn’t justify paying $75-$100 for a childhood memory. It couldn’t be just any of the versions either. 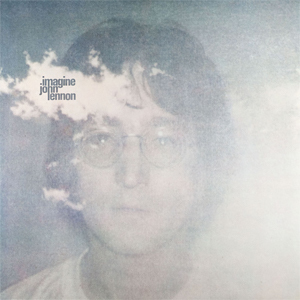 It had to be my particular version from the year 1966. When I was nine years old I got this baseball game. I don’t remember if it was for Christmas or what the occasion was but it was called All-Star Baseball Game and it was made by Cadaco. When I asked the vendor how much he wanted for the game I couldn’t believe my ears. “Five dollars”, he said. I couldn’t get the five dollars out of my pocket fast enough! He obviously didn’t value it nearly as much as I did! There it was! I couldn’t believe my eyes! What gave the game it’s uniqueness was how they made it so realistic. They took statistics from players in the major leagues and made round cardboard discs of that player that represented his performance statistically. For instance if a player hit a home run five percent of the time the home run number on his disc would be five percent of the total space. The discs were put on a spinner and there were two spinners (one for each side). The player not batting had a spinner to spin too. If the player batting spun a number representing a fly ball the other player would spin to see if his team caught it. The same was true for a ground ball. On hits the defensive player would spin to see how many bases the other runner on base got or if he possibly could throw out a runner stretching a hit. My cousin Wendell and I would spend the night at each others house often. The neat thing about it was that we were allowed to stay up as late as we wanted to. Of course we did it in the summer so school wasn’t involved. He or his older brother Lawrence had an All-Star Baseball game too. I’m not sure whose game it actually was but it was available to us! There were times Lawrence played right along with us even though he was 5 or 6 years older. The game would start with drafting players. We would put all of the discs in a big pile and then take turns pulling players for our teams out of the mix. You had to fill all of the positions and then maybe add a few subs. Then we would take 5 or 6 pitchers each and we were ready to go. We would sit there long into the night playing the game. Spinning the spinner over and over. Moving our pegs from base to base. Figuring team statistics after the games. One time that I remember as clear as if it were yesterday I was spending the night at Wendell’s and we were playing the baseball game. His brother Lawrence was there too but he wasn’t playing with us that night. Lawrence was 18 and he was a very skinny excitable kid although at the time I didn’t think of him as a kid. He also smoked a lot and on this particular night or morning he was smoking more than usual. He was very talkative and at this particular time he was talking even more than usual. But it wasn’t his normal talk. It was more of a nervous scared kid as he listened to the radio. My memory tells me it was at night but it doesn’t make much sense because of what was happening. Like the way Wendell and I were drafting our players Lawrence was involved in a different draft. On that morning or night they were in the process of picking dates of the first 18 year old boys to get drafted to go to Vietnam. Each birthday was drawn out of a baseball cap (in my imagination) and the first ones drawn would be the first to get drafted. The radio was broadcasting it like a baseball game. They would pick a date and pause for a little while and pick another date. All the while Lawrence was smoking one right after another and scared out of his wits. He couldn’t get very excited when his number wasn’t called because he knew the next one could get him. It was almost like he was in the war and the enemy was shooting at him. Trying to dodge the bullets was a skinny kid whose life had seemingly just begun but now faced a decisive day as to it’s future. My next door neighbor Bob and I were good friends. His brother Al served in Vietnam. Since he was much older than me I accepted the fact that he was gone away more easily. Finally after he served his time Al got his discharge. Instead of letting his parents know Al had something else in mind. We lived within walking distance of the airport. Al decided to fly in and make the walk to his parents house and surprise them. What a surprise it was when Al showed up on the doorstep. There were tears of joy on a day that was long remembered! Looking back the irony of that day at Wendell’s was mind boggling. Here Wendell and I were spinning the spinner with our disc in place. Lawrence sitting there with the radio on smoking up a storm. In reality it was like he was in a separate game. Maybe his game would be called “War” and it seemed that game was played differently. Wendell and I chose our team based on how we perceived the skills of the players. In the game Lawrence was in it was a random draft. One player was just as good as the other in that draft. It was like Lawrence was actually on one of those discs we were spinning. But instead of hits or outs that disc was divided into 365 numbers and each little section had a number between and including 1 through 365. 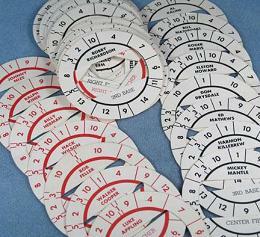 After each spin the resulting number was slotted into the sequence it was picked. Maybe the top one hundred numbers were sure to go. One of the numbers on that disc was Lawrence and the longer he could go without his number called the better for him. The object of the game he was playing was to have his number slotted near the end of the drawing. It may seem kind of crazy but our baseball game kept going. We drafted our players and spun our spinner like nothing was happening around us. Lawrence tried to draw us into his game with updates on his status. He did draw our interest and answered our questions patiently. Question after question as only 11 or 12 year old kids could ask. It was amazing that he was able to talk to us at all sitting there with his future in the balance. Meanwhile our minds drifted back to our game and spinning the spinners in the hopes of scoring runs and making statistics! I remember watching the news in those war days. Each day Walter Cronkite would read the statistics on the war. Kind of like a baseball games post game show. This was like the war games end of the day rap up. Total Americans killed today and a number. Total Vietnamese killed and another number. Sometimes we would see some play by play as a journalist took us behind the lines. We could see our troops over there fighting for their lives in the jungles. We would see explosions all around them as they fought on. Most of the time however it was just the cold hard statistics that Cronkite would read. What would Lawrence’s future hold? As I looked back on that day I started thinking that maybe we could have been more supportive to Lawrence. Maybe we should have abandoned our game and put our whole attention on his radio and him. I started thinking about the lesson I learned from this place in time and what I might be able to pass on. The theme kept coming into my mind that so many of us are busy playing games while our neighbors are hurting. Although this is a very true statement this conclusion just didn’t seem to fit our situation in this case. What could an 11 and 12 year old do in this uncomfortable setting to help their older brother and cousin? Maybe the best thing we could do is just what we did. We continued to be kids and played our game. What purpose would be served by stopping our game other than causing even more discomfort for Lawrence? After all maybe the fact that we were playing a game made him dream of a time when he could leisurely play a game without it being life and death. Maybe the most important thing was that we were there. Maybe the lesson out of all of this is even if you can’t do anything being there is important. It wasn’t that we comprehended everything that was happening, but we were there even if it was unplanned. When we started playing the game we didn’t realize his game was going on. When he came in smoking his cigarette with his radio, as he voiced his nervous giggles we realized that there were two games on the agenda. We didn’t drop our game, but we definitely paid attention to his game too. Not all of the Vietnam stories had happy endings like Al’s. There were 58,138 U.S. Soldiers that died in the Vietnam war. Fortunately Lawrence was not one of them. He won his game that day! I think his number was over 300! I don’t remember who won most of the games Wendell and I played. Our games were fun games with results long forgotten. Our games were kids games where life is fun and problems come later. Two years ago Lawrence died. It was some forty years after that fateful night. Lawrence ended up losing a war to inoperable cancer. I don’t think I cried when I heard the news. It was an expected thing because the cancer had eaten away Lawrence’s skinny body. There was not much of him left when he departed. It was more of a relief knowing that his suffering was over, much like the relief he felt when the draft numbers fell his way. It’s strange that relief can come from both death and avoiding death. 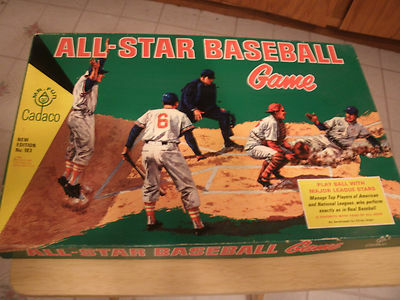 When I bought that All-Star Baseball Game I was thinking about my childhood. I was sure it would bring back memories of games past. In fact that is exactly what it did, but in a much different way than I anticipated. Little did I realize that the memory it would take me to would be a transition place between being a boy and a man. A time that would decide if my cousin Lawrence would jump right into manhood and possibly die for his country or if he might be able to remain a boy and play a few games for just a little longer? The other day as I was thinking again about the memory of Lawrence on that day tears filled my eyes. I’m sure it was a belated mourning of Lawrence dying as I thought of the games we played that night. Wendell and I competing for honors in a baseball game while Lawrence was involved in a much different game altogether. We were two kids playing a game of chance for fun and one young man who was on a playing piece in a game of chance with his life and future on the line. It seemed like an almost perfect golf shot in my golf world. It was straight down the middle and maybe 220 yards. For me and most other people that is very acceptable. Yet when we drove the cart toward the path of the ball we discovered a stream running directly over the fairway maybe 10 feet wide. My ball was nowhere to be found as the hazard ate it. Many times I have hit the ball crooked and felt like I deserved any trouble I found myself in. Yet here this shot seemed so perfect. It didn’t seem fair that my ball was lost and a penalty stroke was needed. There is a course here in town that had a similar issue. Hitting an almost perfect drive right down the center of the fairway you could find yourself behind a tree. That’s right, someone had planted a tree in the middle of the fairway! This tree was there for years and I’m sure was the brunt of many a curse word throughout time. One morning workers at the golf course noticed something very strange. That tree that was the enemy of thousands of golfers throughout the years was discovered laying dead in the fairway. I mean literally laying there the victim of a middle of the night sawing. I guess a golfer having been victimized once too often by the giant with the big trunk and long branches had decided to take the law into their own hands. Climbing over the fence at 3 or 4 in the morning towing their chainsaw, the deed was accomplished. While many of the adjacent neighbors slept through it I can imagine someone waking up from the roaring of the saw wondering what in the world? While many non golfers scratched their heads when they heard the news, I believe that many golfers rejoiced and felt the sawing was completely justified! Golf can be the strangest of games. Unlike other sports that we play where the ball is moving before being hit or kicked, the golf ball just sits there as still as can be waiting for it’s punishment. Yet, hitting a golf ball straight is a constant battle even for the pros. It is hard to believe sometimes how a Tiger Woods or any other pro who practices all of the time can mess up so bad. Yet, if you think about it, the game is designed for the average person and sometimes the pros to fail. There are 300 to 450 dimples on a golf ball. The dimples are designed to make the ball better able to cut through the air reducing the drag effect. Dimples also allow the effect of side spin in shot direction. When striking the ball if the club head is the slightest percentage off of squared the ball will not go perfectly straight. Multiply that factor by an incorrect path of the swing and you can see how difficult it is to consistently hit the ball straight. The course designers know this fact and they can make it very difficult for most of us who are not consistently on the fairway. The fairway is a place of low cut grass that is perfect for hitting the ball on. When we go crooked we encounter the rough. The rough is just as it sounds “rough.” You will find your ball on hard ground or in deep grass or both. Sometimes the ball will get buried by the grass and will be tough to hit solidly. When we do hit it solidly there may still be a problem of trees, bushes, and sand traps to maneuver around and over. On a normal hole keeping the ball straight and in the middle of the fairway is the way to go. Hitting from the low grass will help to hit the ball solid and straight on the next hit. Every golfer knows this simple rule, but executing those straight shots is very hard to do. John Feinstein wrote a book called “A Good Walk Spoiled.” Just the title tells volumes about how the game of golf can make such a good thing into a painful experience. One time years ago I went to play a course by myself. In those days if you were alone the course worker would try to put you in with another group. In this case he put me with a married couple. It got to be a pretty embarrassing situation because the guy was not playing very well at all. Every shot he was hitting was a mishit. He started throwing his club and making a scene. It was embarrassing for his wife and a distraction to me. In his case it wasn’t a tree, it wasn’t the course difficulty, and it wasn’t that something was wrong with his clubs. The problem was him, and that is the hardest problem for any of us to deal with. Besides the rough and tree problems holes sometimes have water hazards and sand traps. Sand traps are interesting. They are normally placed right around the greens. A good looking shot that seems headed for the green can end up in a sand trap. Playing a ball out of the sand requires some special skills that most of us don’t practice enough. Obviously the game of golf can be very frustrating. You can hit a good looking shot and find yourself in trouble, or you can hit a crooked shot and know you will be in trouble. On the other hand sometimes you get lucky. I was playing with a friend the other day and he hit a ball that was going into the woods. His ball happened to hit a tree or it’s branches just right and bounced in the fairway. A couple of times he mishit his iron shots, but each time it turned out OK because his ball still made the green. We all have had these nice bounces and breaks, but we know they are nothing to depend on. Arnold Palmer had a style that endeared him to the hearts of America. It was a style he called “go for broke.” Arnold was constantly getting himself into trouble but by his great recovery skills, he was able to make incredible shots! Sometimes we all have that Palmer mindset. We hit the ball crooked and it ends up behind a tree. We figure out some miraculous shot that maybe we could pull off 1 time out of 100 and we try it. Naturally we end up in far worse trouble than we were before and with another shot on our score. We try another miraculous shot and the same result occurs. By the time the hole is over we have recorded an 8 or more! The Christian walk has so many parallels to the game of golf! There are the straight and narrow path and there are traps. There are rough areas where we have to walk and there are hazards we are not prepared for. Sometimes in the game of golf we should just take our medicine. When we go astray out into the rough it is often better to just chip the ball back into the fairway. The one stroke in doing that often saves many strokes down the road. The same can be said about Christianity. When we get off of the path the best thing to do is get right back on it. We will all find ourselves with obstacles in our way and potential hazards. When we find ourselves in the hazard it is best to get back on the fairway as quick as possible and start moving forward again! As in golf when trouble comes it is hard not to feel down. Knowing in the troubles of life that God is there to help us makes a big difference! He will help us through the rough spots if we put our complete trust in him! When we find ourselves behind a tree spiritually, we should pray that God gives us the wisdom to get around it. We shouldn’t try to take the law into our own hands. If it is his will God will remove the tree and he won’t need a chainsaw to do it! I can tell you truthfully that there were a couple of incidences in my own life where it was very hard for me to forgive. There may be people in your life that you find hard to forgive also. I’ve always heard that we can do something that God cannot. That is remember the sins of our past after he has forgiven us. He can truly forgive and forget. As for us, we will always have the memories. Yet God can help us forgive but it has to come from him. On our own it is impossible for us to forgive someone. Forgiveness can only come about when God supplies the love for that person in our heart. When we find ourselves holding onto bitter thoughts about someone it’s like trying to run carrying a fifty pound weight. That weight is going to be a burden that will slow us down! I have found when I was slow to forgive it didn’t effect the other person at all. That person went on with their life and here I was carrying the burden. Only when I gave the burden to God and forgave them in my heart was I able to get over and through my bitterness. There is a saying that goes “Don’t get bitter, get better.” God knows that we are going to be wronged while we are on this earth. Things are going to happen that will make us mad at others or mad at God himself. If there is someone you haven’t forgiven remember this, it probably isn’t effecting them. The only person it is effecting is you. You can choose like I did to let that weight go and lighten your load in the race. You will be surprised how good it feels after you give it to God and through him forgive that person! The burden you are carrying will be lifted and you will be able to move on! If there was anyone who you might feel is justified to hold a grudge it would be Jim Ryun. Jim was a world class runner in the mile and 1500 meters. He was the first high school runner to better 4 minutes in the mile. He competed in the Tokyo Olympics at the age of 17 in 1964. He was the silver medalist in the 1500 meters in the next Olympics in Mexico City in 1968. 1972 was to be his big moment. He had trained very hard and just knew that the Gold medal was in his future. I have included a video of Jim’s story! This video is over 10 minutes but it is 10 minutes worth watching! It takes you from his early running days through the 1972 Olympics. Amazing footage through his triumphs and pains and how he chose to forgive. When he brought that unforgiving burden to God it was lifted from him! As you will see he is now running through life free and easy without the cumbersome weight! Jim Redmond was more than a father to Derek Redmond. He was his best friend and the two of them were inseparable. Derek was one of the best 400 meter runners in the world! At the age of 19 he had shattered the British record. Jim knew what Derek was feeling as the 1992 Olympics were about to start in Barcelona. In the 1988 games Derek had to withdraw from the 400-meter race just 10 minutes before it started because of an Achilles tendon injury. Over the next year he went through 5 surgeries. To say that he was determined to make good in the 1992 Olympics would be an understatement. To win a medal after all of the pain he went through and all of the hard work was the only thing he was thinking of. Jim had been there for all of the world competitions leading up to the Olympics that Derek competed in! He was his best friend, counselor, motivator, and loving father. The stadium was packed with 65,000 fans and Jim had a seat at the top of Olympic Stadium. This would be the race that would put Derek into the Olympic final heat and Jim was determined to run the race with Derek from his seat. You see when Derek ran the two of them were so close that it seemed his father was running right next to him! Earlier that day Jim and Derek had talked. They talked about ignoring the past failures and heartbreaks and concentrating on the task before them. They talked about all of the hard work that Derek had put in to prepare for the event. They talked about everything even the unthinkable. If anything bad happens, Derek would finish the race no matter what. Now Jim is sitting in his place high up in the stadium waiting, watching, and anticipating the start of the race. He is as nervous as if he himself were running and in his mind he is going to be with his son every step of the way! The top four finishers in each of the semifinal heats qualify for the Olympic final. The race begins and Derek quickly takes the lead. Jim is in a zone as if running every step of the way with his son! Keep it up he urges as Derek reaches the halfway point. Then without warning the unthinkable happens. Derek hears a pop in his right hamstring. He hops on his good leg before falling on the track. The other runners finish their race and leave Derek laying on the track in pain. When Jim see’s his son in trouble he races as fast as he can down the bleachers. He is dodging people and bumping into people along the way. He keeps moving forward. Without any credentials to be on the track Jim finally gets to the bottom row of the bleachers and races onto the track. Security people start chasing him but he won’t be stopped. The medical crew arrives with a stretcher but Derek tells them that he will not use it. “I’m going to finish the race”, he said. Derek pushes himself to his feet and begins the long journey of hobbling to the finish line. With about 120 meters to go Jim finally reaches him. “I’m here son and we will finish together”, he tells his son. Derek uses his fathers shoulder to cry on and to lean on. As the two of them struggle toward the finish line the 65,000 fans are going crazy! Just before they reach the finish line Jim lightens his grip and Derek goes through the finish line alone. Once he crosses the line Jim and Derek embrace again as their tears are felt by thousands at the event and millions watching on TV. If you look in the medal winners for the 400 meter run in the 1992 Olympics you won’t find the name of Derek Redmond. Yet because of his determination and courage and the love of his father, his name will always be associated with what the Olympics are about! Pierre De Coubertin, the founder of the International Olympic Committee, believed that ‘The important thing in life is not to triumph, but to compete,’ and encouraged everyone to compete against themselves. His sentiment was institutionalised in the Olympic motto which challenges each individual to become the best they can: ‘Citius, Altius, Fortius’ (Faster, Higher, Stronger). The Olympic games in London will be here soon. Athletes from all over the world will be vying for medals. Some of their names will be on every tongue for a little while. Whatever the results and the fame that these athletes will attain for the moment their moment will pass. It has been twenty years since Derek Redmond fell on the track. Derek Redmond did not win a medal in that Olympics. Yet, of all of the people that competed, his name is still remembered. His father Jim responded as our heavenly father does with us. He was someone with compassion that was there to be leaned on. He was there to help Derek finish the race. Now repeat after me I started “I can’t do anything”. The teenage boys looked a little puzzled but went through the motions “I can’t do anything’, they repeated. Then I followed with “now repeat this”, and I continued, “With God all things are possible!” They repeated that phrase a little more enthusiastic but not much. I don’t know what I was thinking but I had wavered far from the script. It was a high school boys basketball league and I was one of the coaches. It was a Christian organization and each week there was a devotion before the game. It was the job of the coaches or referee assigned to the game to lead the group of both teams in the devotion. The script was written out and was supposed to be read. It was a booklet with a story and things to think about at the end. Most of the kids treated the talk as just a formality before they could play the game that they loved. I went on to tell a story I shared on this blog in January. It was about a lady in a counseling session with my pastor at the time. She stated “Pastor, I’m going to be a better Christian, I’m going to read my Bible and pray more, I’m going to…and on and on she talked.” The pastor told us “right there I knew that she was doomed for failure.” His reasoning was that she was doing things in her own power. He knew that her “I’m going to” phrase could only lead her to failure. At the end of my little talk I had them repeat after me again. “I can’t do anything” and then “With God all things are possible!” I don’t remember who won the game that day, but those words at the little devotional are and will always be true! Sandy Koufax was one of the greatest pitchers in the history of baseball. He is the youngest player ever inducted into the Hall of Fame. He pitched in the major leagues for 12 years. So you probably would conclude if you didn’t know anything about his career that he must have been a success from the start. Nothing could be further from the truth. For the first six years of Sandy’s career he had a record of 36 wins and 40 losses. The best word to describe his pitching up to that point was mediocre. Sandy was blessed with an outstanding arm. He had a fast ball that blazed from his hand. His problem was that he didn’t know where it was going from one pitch to another. He had a problem a lot of pitchers have had over the years, he was wild. Norm Sherry was Sandy’s catcher in 1961. In spring training he had a talk with Sandy. “Why don’t you try not throwing the ball so hard”, Norm offered. Sandy tried what Norm suggested and found that by not trying to throw the ball as hard as he could he actually could control it. He also found that he had about the same velocity on his pitch as he did when he was trying to put the extra umph into it! From 1961-1966 Sandy had one of the best if not the best six year stretches in baseball history and it came about because he quit trying to do too much! 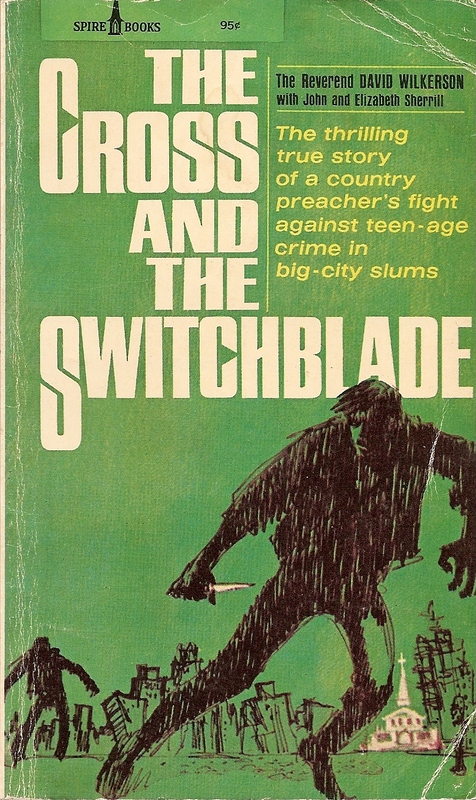 David Wilkerson tells a story in his book “The Cross and the Switchblade” that was a big help to him in his effort to reach the gangs in New York City with the gospel. As you may or may not know Wilkerson was a “country preacher” in Pennsylvania when he was up one night paging through a Life Magazine. He came to a story about a gang of teens in New York City who had murdered a handicapped kid. God started speaking to Wilkerson about going to New York City. Wilkerson could not get the thought out of his head and went back to the city numerous times. He never got to meet the gang members he saw in the magazine, but he was led to have a city wide crusade for teens. For four straight nights Wilkerson preached to a small amount of gang members with little or no success. As he was driving home totally depressed from the lack of success of his efforts, a gang member who he had befriended said to him, “you are trying too hard.” That little message from a gang member who knew nothing about God made Wilkerson laugh. He realized that he was trying instead of leaving it to God. That was the turning point as the next night when Wilkerson turned the whole effort over to God the big breakthrough occurred! In the middle of his sermon with the gangs in their usual mockery mode Wilkerson bowed his head. “Lord”, he said, “I’ve done all I can do, if any good is going to come out of this meeting it will have to be from your power.” While he had his head bowed the room slowly became quiet. Now Wilkerson could feel the presence of the spirit! “He’s here”, he said “and he’s here to change your life today.” When he gave the invitation many of the gang members actually ran up to the altar to have their lives changed. All of this started when Wilkerson took the advice of a homeless gang member who knew nothing about God. He realized that he was trying too hard and stepped out of the way so God could take over! Sometimes I have to laugh when a person with high tech knowledge talks to me about what is wrong with my computer or what they did to fix it. When they leave my head is spinning and I’m thinking “What did he just say?” Usually it’s the case of don’t explain how electricity works to me, just show me where the light switch or where to plug it in. The same can be said about God. We don’t have to know how he works, we just need to know that he does! We cannot supply the power, but if we plug in to his power he can do great things through us! Thinking back on it I wasn’t entirely right in what I said to those teen basketball players that day. I said “I can’t do anything.” Actually there is something I can do. Like Koufax and Wilkerson I can quit trying so hard. I can plug myself into God’s power outlet and let him use me. Posted in Christianity and Sports, Connecting to Gods Power! The year was 1964. The average income was $6,000. Gas was 30 cents a gallon. A new car averaged $3,500. A loaf of bread was 21 cents, a postage stamp was 5 cents and the price of tickets to the movies was $1.25. The average house price was $13,050. None of those prices mattered to a 7 year old kid. Somehow as luck would have it I had a dollar in my pocket! I don’t know where I got the money. I may have found it laying around in the house or maybe it was a gift. I did know that I was on my way to Reed’s Party Store to see what I could buy! An item with a price I was interested in was candy! I knew I could buy a candy bar for 5 cents. Let’s see I could buy 20 candy bars. When I got to the store mixed right in with the candy boxes was a box of baseball cards. They were also 5 cents and I decided to buy all that I could. I don’t remember if I bought 20 packs or if I could only buy 19 with tax involved. I do remember that I walked away without my dollar but with a brown paper bag filled with packs of baseball cards! Why baseball cards you might ask? Well a few months earlier my family had taken a trip down to Alabama to visit relatives. My older cousin must have noticed how bored I was in a strange place and let me play a game with him. The game was flipping his baseball cards with the target of a baseball cap he had placed in the middle of the floor. We must have flipped cards for hours it seemed, though for a young kid time has no meaning. My cousin didn’t know how much I appreciated his attention and him including me in his game! He also didn’t realize how he influenced that first big purchase of my life! Looking back, I think I made a wise frugal decision. Buying candy would have been good for awhile, but it probably would have given me a belly ache. It wouldn’t be long before all of the candy was gone. Buying the cards was like a 3 in one package. First and foremost was the cards. Secondly was a stick of hard gum in each pack. Thirdly in some if not all of the packs was a baseball coin of players with writing on the back about them. The reason for the purchase wasn’t the gum or the coin, it was the cards! I discovered that each card had the players name, picture, and the team he played for at the top. Imagine a 7 year old kid opening 19 or 20 packs of cards. Pulling the stiff sugared gum out of each one and possibly a player coin. Leafing through the cards as I opened them. Actually the players names meant nothing to me. I had never heard of any of them. It was like a new adventure. Like reading about people from another world, grownups playing a kids game. On the back of the cards were batting or pitching statistics along with heights, weights, and comments about the players. There was also a little trivia area on the bottom on some of the cards. A question was asked and you had to scratch off the space given with a coin or some other object to get the answer. For some reason not ever explained some of the cards had the trivia questions and some did not. On the back of the Lou Brock card it asked the question, “What was the most positions played by a man in one season? The answer found from scratching the answer spot with a coin was Jim Walsh in 1911 playing for the Phillies played all 9. With the answer they had a little cartoon that illustrated their answer. It was a little extra designed for the market of their product…kids. I also found some very interesting stories on the backs of those cards, some explained and some not. 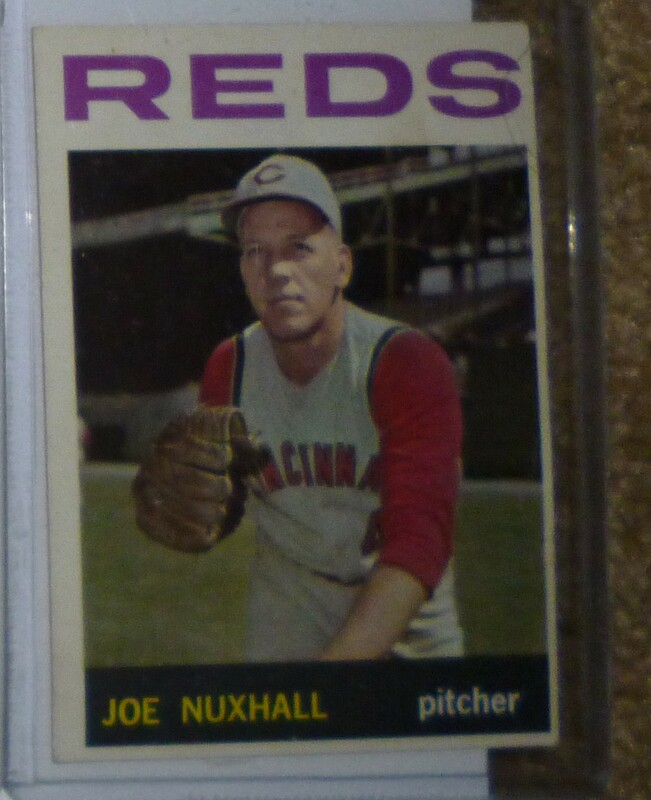 An interesting mystery was the statistics of a player named Joe Nuxhall. On the back of his card was an entry of an inning he pitched in 1944. One game, one inning pitched, 5 walks and an earned run average of 45.00. In the comments it mentions that Joe pitched in his first major league ball game when he was just 16 years old! To a young kid who didn’t know much about the game the story wasn’t that special. However years later I found out the story behind the story. It was during World War II and Joe played on a semi-pro team with his father. The Reds were interested in signing his father since all of baseball was looking for able bodied talent. Most of the able bodied men of baseball age were fighting in the war. Since his father told them he wasn’t interested the Reds became interested in his son. On February 18th of 1944 Joe was signed to a major league contract.Joe was the size of a grown man even at his young age. On June 10, 1944 playing against the Cardinals and trailing 13-0 in the 9th inning Joe was called into the game. He retired the first hitter on a ground out before yielding 5 walks, 2 hits a wild pitch and 5 runs. Joe did not make it back to the major league until 1952 8 years later. The statistics on the back of my card had him with 109 wins. He was 36 years old at the time and ended up with 135 wins for his career. The quirkiness of the situation was best explained by Joe years later. “I was pitching against 8th and 9th graders, kids 13 and 14 years old…All of the sudden, I look up and there’s Stan Musial and the likes. It was a very scary situation”. For the record my card wasn’t quite right either, Joe was 15 years and 316 days old. The card did mention something else Joe did that few had. Joe struck out 4 men in one inning. A few years later I figured out the mystery after seeing the same stat on a Bob Gibson baseball card. If a player strikes out but the ball gets by the catcher he can run to first base if there is nobody on base at the time. In the statistics it is recorded as a strikeout. Apparently both pitchers struck out the batter but the catcher couldn’t make the putout and it was necessary to strike out the next guy to get the “third out”. An old box was found and I dumped my cards in it. There was no trying to protect the corners with plastic sleeves or anything like that. Taking them out of the box with a hands on effort was just what I wanted. I wanted to touch, feel, and play with the cards just as I would any other toy. I tried the flipping game with my cards just as my cousin and I had. I had a bunk bed and getting on the top bunk and flipping the cards toward the cap I placed on the floor was an unusual challenge. My bedroom floor was made of wood. Between all of the wood pieces were small spaces. Those spaces were just a perfect fit for cards to be placed so they would stand up. The cards were carefully placed in their baseball positions. Sometimes players with gloves were used in the field, although most of the time players posed with their bats. There was no compromising though. If a player was an outfielder he was not placed in the infield and infielders did not play the outfield. Once the cards were lined up in their positions the game could begin. My sister and I played many hours of this marble game. Oh yes, we played with a pencil and a marble. One player would roll the marble from the pitchers slot and the other would hit it with the pencil. If the marble hit one of the cards that was standing it was an out. Obviously the cards took a beating in a game with these rules. Just getting them into the cracks would sometimes damage the bottoms and if the marble hit them they paid for the catch they made. Yet, the fun of the game was worth more than the cardboard cards in our minds. When I wasn’t playing games with my cards I was pulling them out and sorting them or reading the backs. Comparing statistics of like players was a fun thing. The next year I went to Reed’s looking for some cards but they didn’t get them in that year. 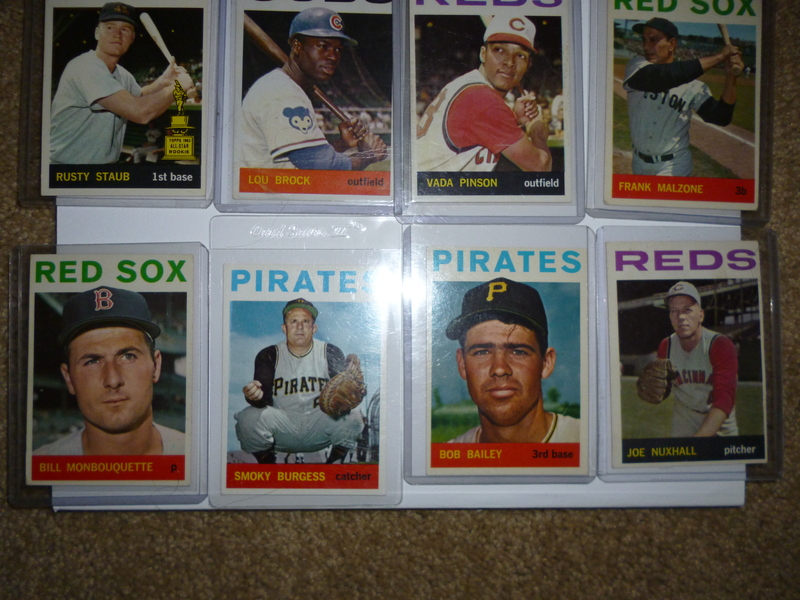 One day on the bus a friend gave me some 1965 Topps baseball cards he found on the playground. There were maybe 15 of them. That was my only exposure to 1965 cards. 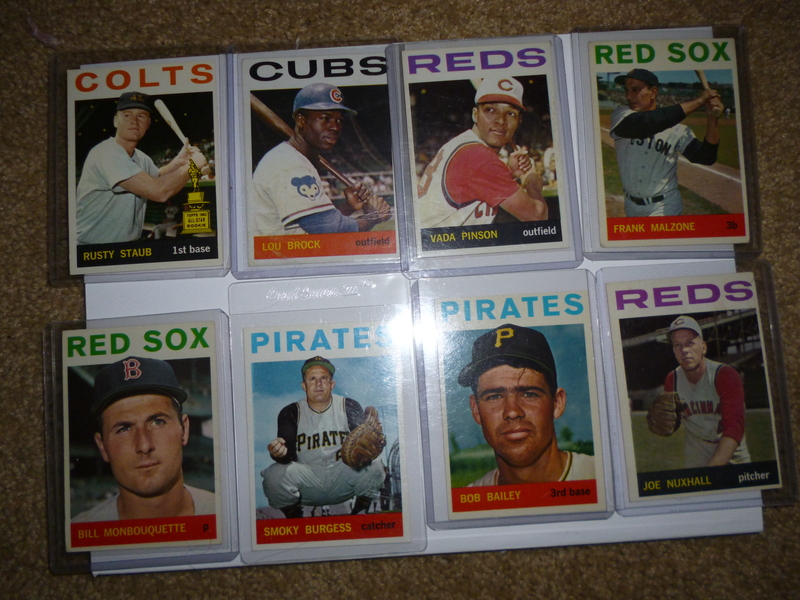 In 1966, 67, 68 and 69 Reed’s had baseball cards again and I bought my share. Maybe it was because the 1964 cards were the first I bought or maybe it was the fact that we had so much fun with them, I can’t say. But those cards were always my favorites. Amazingly I kept my cards through the years. I have pictured some of my cards and their damaged condition. Years ago I thought it would be a really neat collection to find my cards I still had from 1964 in mint to near mint condition. It took a few bucks but i was able to purchase many of the same cards I bought on that day in 1964. Pictured you will see a few of my original cards, worn out by the games we played with them and how some looked when I first bought them. I have some cards today that are worth more in the eyes of card dealers, but this collection is the dearest to my heart and will never be sold. Above: A few of my old cards displaying the creases and ware that were marks of love! 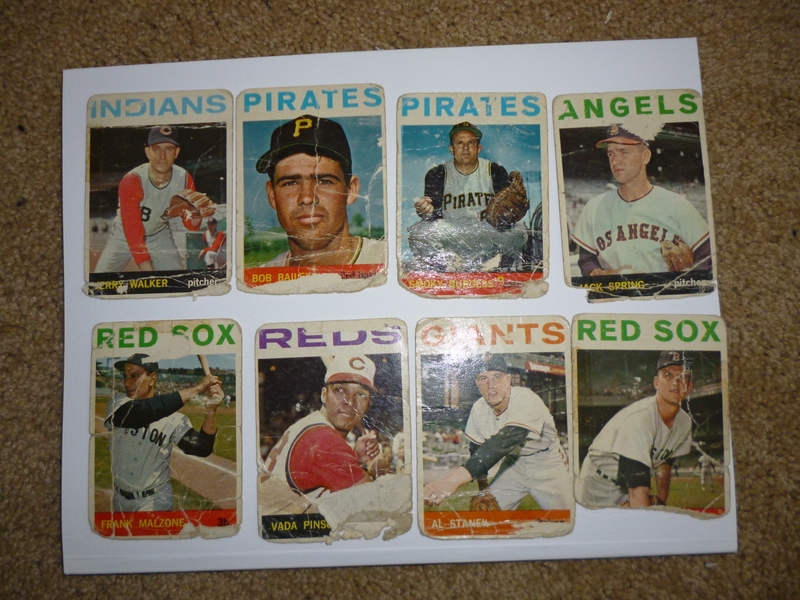 Below : What some of my cards looked like when i bought them in 1964. 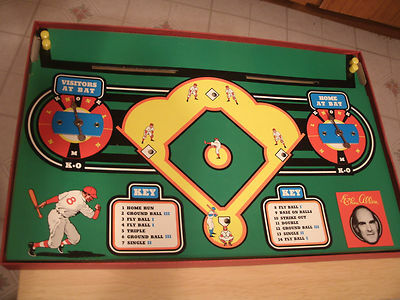 Smoky Burgess (pictured above) was the catcher we always used in the marble game. I never knew the story about why he was called Smoky? The back of the card says he lived in Forest City, NC. That probably explains his real name which was Forrest. He was crouched in perfect catching order and that is why he was our all time catcher. He was only 5’8 inches tall which for a catcher or any major league player seems pretty short. The Burgess card wasn’t the only card that was intriguing. With every card there was a story and with every story there may be 3 or 4 questions from a curious 7 or 8 year old. Rusty Staub and Pete Ward for instance had little trophies on the side of their cards. Topps 1963 All-Star Rookie is engraved on them. Rusty also played for a team called the Colts. It was only later that I learned that the Houston Astros were originally the Houston Colt 45’s. Interesting also is the fact that Rusty had just turned 20 years old when the 1964 season began. He showed enough promise to earn the Topps Rookie Award at the age of 19! Today the baseball card industry has been taken over by grownups. When you go to a sports card show very rarely do you see a kid buying cards. The fact is the collectibles craze has priced the kids out of the market. No longer are the kids encouraged to play with their cards like I did. Cards are meant to be treasured in plastic sleeves and please don’t damage the corners! You might say my cards were damaged but I think a better term for it is worn. It’s like buying a glove or a bat and using them. Sooner or later they get worn out, but the enjoyment of playing with them should have been their purpose. I’m sure that there are a lot of similarities with my baseball cards and how God looks at us. I’ll bet if cards could talk they would rather be loved by kids rather than be in card dealers showcases. The very purpose of baseball cards was for kids to play with them. Sometimes we feel that we are not being used by God. Maybe it is like the story of Joe Nuxhall where we are just not quite ready for the job. On the other hand maybe we sit in a showcase and look good to those who see us without ever trying to be used for what God has planned in our lives. I think those blemishes on my old cards are like what God looks at when he sees his faithful servants getting older. Every wrinkle and crease is seen as a memory of the times they were doing exactly what they were created to do. I think I was 8 or 9 years old when I got my first electric football game. It was made by a company called Tudor and it came with players that were yellow and white. On the box it said “Plan your offensive and defensive strategies.” Now what sports nut kid like myself wouldn’t love that? The game also came with paint and a brush to actually make some nifty uniform colors. I didn’t paint any of my players. I think my sister one day painted a couple on the white team. Along with the paint there were stick on numbers that came on a wax type paper. The game included 2 goal posts that were to be pushed into holes right on the goal line. That’s right, the goal posts back then were located right on the goal line not 10 yards back like today. They were in the form of an H. On one end was a dial that was supposed to act as a game clock. I never used the dial and seriously doubt that it worked. I played the game until I was tired of it and then the game was over. There was a screw at one end that controlled the intensity of the vibration. To anyone not familiar with electric football the game was played on a vibrating field. With the control switch in hand you lined your players up and then turned on the vibration and watched the action! Each plastic player was on a little stand. The bottom of the stand had 4 little sticks of plastic that ran straight down. Those tiny sticks actually helped control the players direction as the vibrating field maneuvered them. The ball was just a miniature hard piece of cotton. A specialist player was also provided for each team. This was the quarterback-kicker. This player would not play in the game unless you decided to pass or kick. At that point you were supposed to shut off the vibrations and attempt to press the ball back in his hand like a sling shot. The ball would fly down the field and hopefully hit a player on your team. If it did it was considered a completed pass. The game was stopped for the kicker too. With a flip of the lever behind his shoulder his leg would swivel into hopefully a successful kick of the ball. In all of the advertisements for electric football, the games were played by 2 friends competing for football glory. 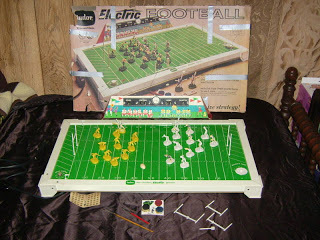 My electric football was an individual game. I played that crazy game for hours. I didn’t have much use for the quarterback-kicker guy. I was more interested in seeing how the players advanced down the field. I think there were 3 different poses a player might have. The obvious blocker with his arms folded, the defensive specialists with their arms out, and the stars of the team with their running poses and their right arm in position to slide the ball in. Naturally my favorite player was one of those star players. I never gave him a name but he was number 89 of the yellow team. I don’t know how it happened but that particular player had a way of dodging the other players and heading up field with an uncanny ability. Well it seemed like great ability to an 8 year old kid anyway. I would usually line him up in a pile going straight, but somehow he would bounce to the outside and straighten himself up and head down the field faster than any of the other players! Over time his number 89 peeled off and I just put a number 1 on his back with a marker. Truly he was the best ever and deserving the top number! For a couple of years I played with that game so much that one of the wires got frayed. The only way to make the game work after that was to have the switch clicked on all of the time and connect the wires to make it go. My parents must have noticed my game’s sad shape and the fact that I was constantly shocking myself because that Christmas I got a new electric football game. This one was called The Super Dome and it was much bigger and fancier. It had pictures of all of the famous football players of the day on the outside rim of the field. For some reason though I never had as much fun with it as I did that basic little Tudor model. One thing I enjoyed doing while playing with my game was lining all of the players at one end and having them race to the other end. Usually number 89 and later number 1 would win the race. Sometimes a dark horse would take the honors. Invariably there would be a player taking the lead and looking like a sure winner only to turn on a dime and start going the wrong way. From constant use and the wearing down of their little guider things on the bottom of their platform, players could change direction in a split second. Sometimes they would get tangled up with each other and start spinning around together. Other times they would get turned to the out of bounds of the game and the vibrations would cause them to just stay turned bumping aimlessly into the side. Other players would go in circles. Still others got stuck in one place no matter how much the vibrations were turned up. This was probably caused by completely worn down guiders. Sometimes if I wanted to see a faster race I turned the vibration up. Invariably some would fall down and lay there helplessly spinning on their backs. It occurs to me all of these years later that we are a lot like those electric football players in the race to heaven. Some may take the straight path, but far too many of us will get tangled up, lose our way, bump aimlessly off to the side, go around in circles getting nowhere, or just continue to be glued to one spot. When trials come many of us fall down and are not able to get up. When those figures fell down I was quick to set them upright, turn them in the right direction and watch their new progress. That is exactly what God does for us. Sometimes it takes falling to get back on the path to victory! I never gave number 89 a name but I think I’ll name him the Apostle Paul. One who ran swiftly and straight for the goal no matter what came his way. In a distant part of my mind I hear a faint sound of a game vibrating from days long ago. I see 89 (Paul) straightening himself out and gliding down the field. I see the kid in me smiling and shaking his head in amazement! These days more than ever kids are encouraged to play sports at a young age! Playing sports can be a good experience as it promotes competition, teamwork, and friendship! When I was a kid it was all about Little League Baseball! Now kids are encouraged to start early in soccer, basketball, tennis, baseball, golf, volleyball and the list keeps going! If you have kids that are or have participated in sports you have probably watched the games pretty closely. We as parents often have a tendency to watch our own kids even more than the game! For those who watch the games objectively there are several familiar characteristics you will notice. In soccer for instance younger kids tend to be ball followers. It’s like a swarm of insects migrating to the ball as it is kicked around in all directions. 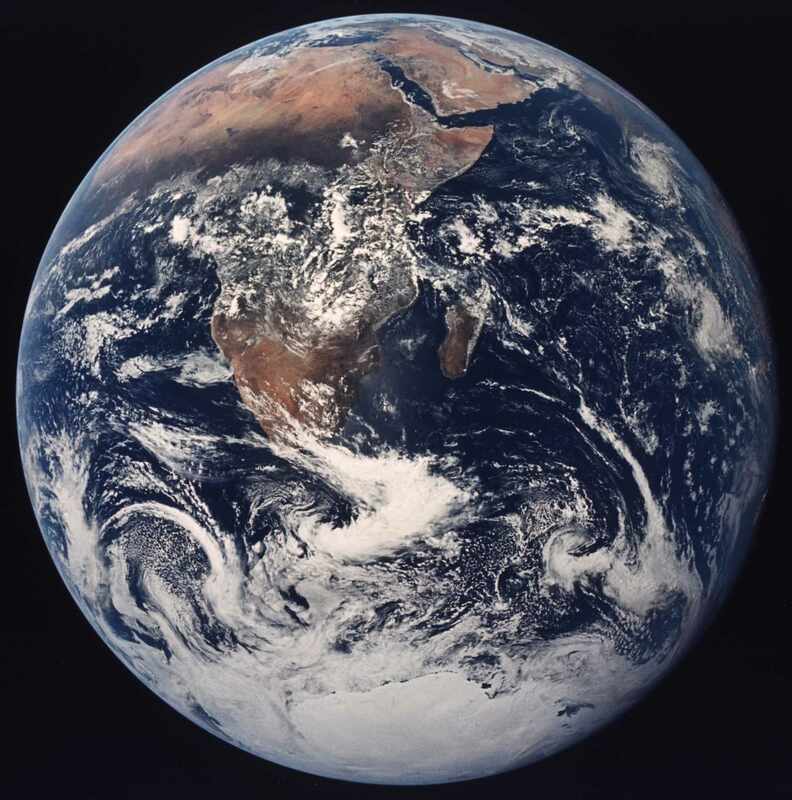 It is a cluster of bodies all in limited space with the ball leading the way. Basketball has the same dynamics. When younger kids play, you will see dribbling and more dribbling. When the dribbling stops the shooting starts. If a shot cannot be negotiated, teammates come racing over to give a helping hand and start encouraging the dreaded one foot backwards shovel pass. The sequence begins again, more dribbling and more scrambles to reach the player with the ball once the dribbling stops. The result nets a glob of players in close vicinity working apart! A good friend and I were watching a recent football bowl game. Instead of watching the ball we were trying to focus on the other parts of the game. Very rarely in a sport like football are we trained to watch anything but the ball. However, when we focused on the offensive line for instance, we saw a different game! The only time these players normally get noticed is when they don’t do their job! We noted their blocking techniques and saw intensity on that line that reminded us of a war! Seeing how linemen hold or come up with ways to keep their opponent from getting close to their quarterback was amazing! If you are like us, it doesn’t take long until you start focusing on the ball again. Line play is interesting but it is not the glamorous part of football. Very rarely do you see a player who could play every position in a sport. In baseball there are only a handful of players who have! Bert Campanaris comes to mind. One game he played every position moving around the diamond to begin each inning. He even took a turn at pitching! Just the fact that he was versatile enough to accomplish such a feat while not completely making a fool of himself was amazing! When players have played every position in a game it was always a publicity stunt. It was out of boredom after a long season, and to give the fans something to talk about! Never did this gimmick make the team better! In the past I have had a measuring stick for the value of a player. I would ask myself this question. If every player on the team was that particular player, how good would the team be? The players scoring highest on “my test” would be the ones who displayed skills in all areas of the game and had the physical attributes also. A select few superstars in the NBA are tall, can handle the ball efficiently, pass, and score in a variety of ways! To those few, a team of that individual might have a chance to be successful! Basketball is probably the easiest sport to score high on my test. Take LeBron James for instance. Five LeBrons would make an awesome team! Kevin Durant scores high too on my test! Even in basketball however, with only five players allowed on the court at one time, most players would fail miserably on my scale. A team of John Stocktons for instance would make a terrible team. John Stockton is a hall of fame player, and was a great point guard! However, he was only 6 foot 1. A team of Stocktons would be very weak in one essential area… Defense! This team would be pathetic in rebounding and shot blocking. Foes would score at will by throwing the ball into the post against John Stockton the center. On the offensive end going up against taller stronger players would surely limit team Stocktons success. Forget about an offensive rebound or second chance points.! It would be one shot and done with a strong possibility that the one shot would be blocked! In football and baseball my standard leans on the edge of ridiculous! Justin Verlander won the MVP and the Cy Young awards this past season! He was the best starting pitcher in baseball! Yet, who could imagine having 9 Justin Verlanders in a lineup? Although Verlander is a great athlete he wouldn’t perform at other positions nearly as well as players who have trained extensively for those roles. An all Verlander team would have eight below average defensive players! On the offensive side, nine Verlanders coming to bat would be very anemic in run production! Tom Brady is a great quarterback! Year after year he leads his team to playoff and Super Bowl contention. Yet, as good a quarterback as Brady is, a team of Tom Bradys would be a disaster. Imagine five Tom Bradys on the offensive line going against 300 pound pass rushers! The quarterback Tom Brady would not have a chance! Years ago Henry Ford revolutionized American industry with the assembly line. The concept was simply that everyone was a specialist. Giving each person a specific job. he had them do that function over and over. Eventually workers got so good and fast at their job that they could almost perform it in their sleep! The result was a time efficient quality product that customers loved! Since they produced their cars so efficiently they were able to keep the price of their new cars affordable for the average person! It was the ultimate idea of teamwork and it made Ford the leader in the automobile industry for years!! Production and sales increased at an enormous rate! The assembly line became a model that all of their competitors copied! Sometimes as Christians we are ball chasers. We play as individuals working apart. We want to chase the current “hot leader” concerning ourselves only with the question… Am I getting fed? Too often we are spiritually out of shape because all we want to do is eat. A person who only eats and fails to exercise ends up very unhealthy. We must understand that faith without works is dead! The “spiritual food” needs to produce “spiritual energy”! Many on the “Christian Team” do little to nothing. When our production on the spiritual assembly line plummets, we have a tendency to discourage the worker next to us so our lack of effort and desire isn’t as noticeable. We envy a co-workers talents instead of encouraging them as a good teammate would. We lose focus thinking our assigned job is meaningless. When “the quarterback” gets all of the credit we feel cheated. We desire attention and accolades for the job we do! We get unsatisfied and through our discontentment our work isn’t completed. Ninety percent of work in most churches today is done by ten percent of the members or less! How well would a football team do if only ten percent of the players did their job? The mission you are supposed to accomplish in life can only be done by you! You have been given special unique qualities that nobody else in the world has. There is nobody exactly like you! Tom Brady would be a complete failure without his offensive line? By the same token the “Christian Team” falters when members fail to do the jobs they are called to do! Not trying to be “versatile” and do everything, but simply by doing their individual task to help the team as a whole! The Apostle Paul talks about this same concept in I Corinthians chapter 12. Verse 12 says the body has many parts, and yet it is one body. If the foot should say I am not a hand so therefore I am not part of the body, it would not cease to be part of the body. If the ear says I am not an eye therefore I am not part of the body it would not cease to be a part. Then he goes on to say if the whole body was an eye where would the sense of hearing be? If the whole body was an ear where would we get the sense of smell? He follows that by adding “the eye cannot say to the hand I don’t need you and the head cannot say to the feet I don’t need you!” Translated into my example, Verlander cannot say to Miguel Cabrera (his power hitting teammate), I don’t need you or Tom Brady cannot say to his offensive line or running backs I don’t need you! The fact of the matter is they are in total need of each other! Their success depends not only on their own skills, but the different skills of all of their less celebrated teammates. Just as everything needs to work in unison with teams, production, and the body we must also realize that within us everything must work in harmony also! We are all managers of ourselves and we need to make sure that “our players” are working together in the most efficient manner! In a football sense, we need to make sure that our offensive lineman has not moved over to play the quarterback position. Likewise, the quarterback better not be blocking on the line! In a spiritual sense this situation, though it seems strange in the physical world, happens all of the time. To help clarify this thought the Lord gave me a poem called “The Trio”. By showing me an earthly management problem, I have come to understand how God sees the spiritual situation we all face. Trying to get a trio of singers to harmonize together as a team is something I can relate to! The goal is a sweet, dynamic, pure, holy song reflecting Christs love within us! It’s achieved through sacrifice, practice, love, and constantly listening and obeying Jesus our coach! When this cohesiveness and unity becomes a reality in our spirit the result is a perfect harmony in our life! Our spiritual “assembly line” begins producing fruit and then much more fruit! What Happens After We Choke? It is amazing to me how often someone in sports is labeled a choke artist or a choker. Choking as it relates to athletics is the inability to perform up to your normal level due to the situation and pressure of the moment. Nobody wants to be labeled a choker. We all want to be that clutch player who always can be depended on no matter what the circumstances. Scott Norwood was a kicker for the Buffalo Bills from 1985-1991. He was an integral part of the rise of Buffalo to a championship caliber team! On October 25, 1987 he kicked a 27 yard game winning field goal in overtime to cap off a 21 point comeback 34-31 win over the Dolphins! In 1988 he was named first team All-Pro with clutch kicking that helped the Bills advance to the AFC Championship Game! He was 32/37 in field goal attempts and made all of his extra points! Scott will long be remembered however for one kick that he missed. It occurred in Super Bowl 25 against the New York Giants. Never mind that the Giants controlled the ball most of the game! They had the ball almost 40 minutes compared to the Bills 20. Never mind the fact that the Bills had other opportunities in the game! Everyone will point to the Bills lining up for a game winning field goal attempt from 47 yards away with 8 seconds left trailing 20-19. Scott kicked it well with plenty of distance, but the ball sailed just wide to the right of the goal post. Scott played the next year too, but after that season ended he was waived for a younger kicker named Steve Christie. Scott left football and always will be remembered for his one failure instead of his many successes. In the final analysis though, Scott was a great kicker! He ranks third in Bills history in field goal percentage and second in points scored! I watched a basketball game recently involving a team I follow with passion. The game was a road game for my team, but we were staying right with them! It was tight coming right down to the end! The other team was up by 2 points with less than 20 seconds remaining. Our point guard made a dash for the basket and somehow got the ball up on the rim as he was fouled! The ball rolled around and dropped in the basket! His ensuing free throw was good and my team was up by 1. To their credit the other team attacked quickly. A couple of passes and a turn around 10 footer and we were down by 1 with less than 10 seconds left. Our point guard made a mad dash again. Trying to duplicate his earlier feat he rose in the air in a flying lunge. His shot was blocked though and there was a mad scramble. Our center, we’ll call Mike got a hold on the ball and attempted to put it up, but he was grabbed and fouled with1.1 seconds left. He would get 2 shots. Mike was having a very nice game! He was our go to guy down low and they were having a hard time stopping him. He was scoring and rebounding well! In fact without him my team probably would have been down 10 or 15 points! Here he was though at the free throw line and the other teams fans were doing everything they could to make him miss. His first shot looked good. It was straight and right on target, but it came up a little short, hit the front of the rim and bounced around and off. His coach could see just how upset Mike was so he called a quick time out thinking maybe he could calm him down. After the time out Mike stepped up to the line and missed again. The other team rebounded and the game was soon over. As the TV camera hit him Mike was devastated with tears in his eyes! He thought that because of him the game had been lost. I was listening to the post game show on the radio and they interviewed the coach. To my surprise the coach seemed almost upbeat when they talked to him. I know he was feeling deeply hurt by what just had happened. Yet, he was more concerned about his player and how the team was going to pick up his spirits. He mentioned that they would get back to the gym in the next few days and work on free throws and maybe if that situation arose again he would knock them down! He was looking at the future instead of dwelling on the past! His team still has the conference tournament in front of them and there are other important games to be played! Simon Peter was one of the 12 disciples. Peter was outgoing and brash! In his mind he was the main go to guy for Jesus! In his mind he was “Mr. Clutch” One time as Jesus walked on the water toward their boat he blurted out “Let me come to you”. Jesus said come and Simon Peter actually walked on the water for a few steps until he took his eyes off of Jesus and sank! Simon Peter was part of the dispute that arose between the disciples as to which one was the greatest. The Bible doesn’t go into detail but I can imagine, knowing his personality, that Simon Peter was loudly making his case for being the greatest! Jesus had to correct them by saying the greatest is the one who serves. Simon Peter told Jesus “Lord, I am ready to go with you to prison and to death.” Jesus told him that before the rooster crows today you will deny three times that you know me. Peter surely thought to himself that Jesus was surely mistaken! If there was ever anything for 100 percent sure it was that Simon Peter could be counted on! Yet, just as Jesus said it would, it came to pass. Peter denied knowing his Lord three times. In the clutch situation when Jesus needed him most, Peter thought only of his own safety. After the third denial he broke down and wept bitterly. He had committed the biggest choke of all time, and he felt like his life was over. Mary Magdalene, Mary the mother of James, and Salome bought spices so they might anoint Jesus’ body. But when they got to the tomb the large stone was rolled away and a young man dressed in a white robe was there. He said “Don’t be alarmed” Jesus the Nazarene who was crucified has risen! Go, tell his disciples and Peter. Did you catch that last part? AND PETER! Peter, the one who made the biggest choke ever was still on the team! God was looking ahead instead of looking back! He was looking at Peter’s future instead of dwelling on his past! Remember when he was walking to Jesus until he got distracted? After “the choke” he kept walking on water in the spiritual sense! In the days ahead Peter would proclaim the gospel with enthusiasm and clarity. disregarding his own safety! He spoke boldly on the day of pentecost proclaiming the good news! He would be imprisoned and beaten for the name of the Lord. Through these trials he came away with the attitude that it was an honor to suffer for the cause of the Gospel! In the new testament you will find the book of Peter! Peter was an ordinary man who did extraordinary things because God didn’t quit on him after he choked! God looks at our lives in the same way! We’ve all done things that are shameful. We have all choked at times under spiritual pressure. But, God is willing to work with us! He doesn’t discard us! We are still on the team! He is looking to our future, not dwelling on our past! He wants to get us back in “the gym” and prepare us for the battles ahead! We may have lost a battle, but the season is still on the line! By focusing on Jesus, Peters life ended with a trip to Heaven! He is in Heavens Hall of Fame! His writings and deeds are forever in the bible for inspiration to millions and millions that came after him! What happens after we choke? Great things if we learn from Peter and renew our relationship with God! After that the sky is the limit! The next poem is called The Gardener and My Garden II. It talks about what happens when the Gardener has to start over with our garden after we have neglected it! Not dwelling on the past, he prepares us for the future!